My Comments: I was favored recently by the publication in the Gainesville Sun of an article I wrote that referenced Donald Trump as an existential risk to the US. 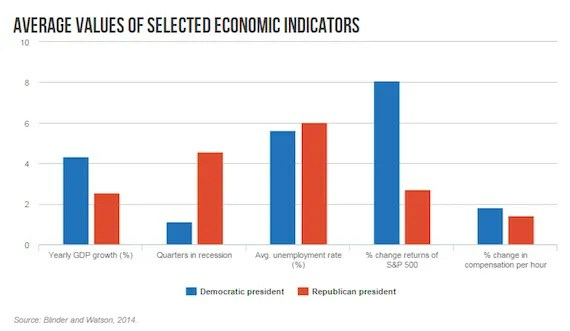 Because such articles are limited to 750 words or less, there was no reference by me to the historical performance of the economy under Republican or Democratic ownership of the White House. In addition, as I’ve noted, factors like low turnout, the rise of the donor class and globalization make it harder for progressives to shift the income distribution. Two new studies of finance show that Democrats have shifted to the right on financial deregulation, dramatically increasing inequality. (One of the studies links campaign contributions to Dodd-Frank roll call votes.) A study by political scientists Alexander Hertel-Fernandez and Theda Skocpol finds that the rise and mobilization of the small-business lobby has divided Democrats on tax issues. Further, a study by a group of political scientists notes that the strong status quo bias, exacerbated by conservative obstructionist politics, makes it increasingly difficult to implement inequality-reducing policies.